Tony directed our critically acclaimed production of White Chirstmas. Tony is an award-winning actor, choreographer and director from Detroit, Michigan. His performance credits include Jinx/Sparky in the Joseph Jefferson Award Winning Chicago company of Forever Plaid, John Adams in 1776, Gabe in Dinner with Friends, Herald in Marat/Sade and Bob Cratchit in A Christmas Carol at the Tony Award winning Trinity Repertory Company. 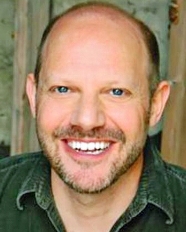 He most recently was seen as Gordon Schwinn in the Stage West Theatre Company's production of A New Brain, as Malcolm McGregor in The Full Monty at The Des Moines Playhouse. Regional credits include Oscar in Sweet Charity, Lumiere in Disney's Beauty and the Beast, Harold Bride in Titanic, Applegate in Damn Yankees, Hornbeck in Inherit The Wind, Cornelius Hackle in Hello Dolly, Noah in The Rainmaker, Ben Gant in Look Homeward, Angel, Otto Kringelein in Grand Hotel and Charlie in The Foreigner. Regional directing credits include Camelot, Seven Brides for Seven Brothers, My Fair Lady, A Funny Thing Happened On The Way To The Forum, Anything Goes, The Unsinkable Molly Brown, Brigadoon, State Fair, Godspell, Pippin, Blood Brothers, You Can't Take it With You, The Mystery of Edwin Drood, Merrily We Roll Along, The Boy Friend, The Importance of Being Earnest and Quilters. Humrichouser's partnership with playwright Robert Joseph Ford on CAUCUS! The Musical! received international attention and was featured by over 200 international, national, and regional media organizations. Most recent New York production credits include assisting Director Lonny Price on the New York Philharmonic's production of Company at Lincoln Center and directing The Other Steve and Edie starring Edie Falco and Stephen Wallem at The Laurie Beechman Theatre. Humrichouser holds a B.F.A. in Musical Theatre Performance from Western Michigan University and an M.F.A. in Acting from Rhode Island College. He is a graduate of the Trinity/Brown Consortium in Providence, RI and a member of the Actors Equity Association.